A good first aid kit is a must in all studios and workshops, as accidents can happen anytime, anywhere, and it’s better to be prepared than to find yourself scrambling around for a bandage or disinfectant. Been there, done that! And, let's face it... we all know it's gonna happen! A small cut may seem insignificant at the time, but if it gets infected you could be out of action for weeks. This is especially important in a teaching environment so, if you have students, make sure you are prepared! 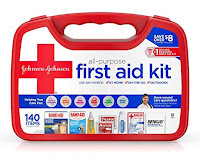 An effective first aid kit provides plasters, bandages, scissors, tweezers, and antiseptic wipes, as well as burn ointment, eye wash, and gauze pads. It's also important to keep in mind that a first aid kit is meant to be used to treat minor cuts, abrasions, and burns. You should never rely on a first aid kit to handle more severe injuries. This Deluxe 250 piece Be Smart First Aid Kit from Total Resources is a necessity for the workplace and meets or exceeds all OSHA requirements for small business. It's in a hard carrying case designed with a multi-compartment organizer. It can be carried around or mounted on a wall in a central location. Airtight rubber seal around a durable plastic case creates the perfect storage for all your first aid essentials. No matter the situation or location, the contents of your kit will always be safe. 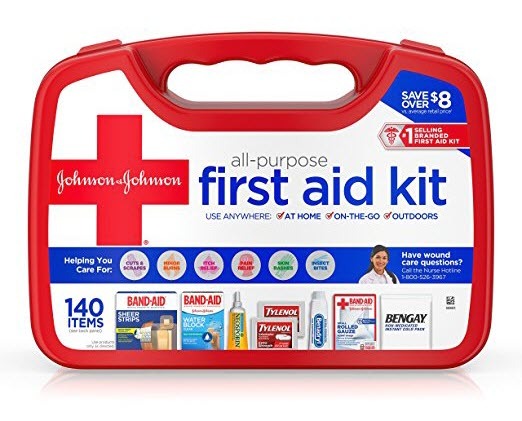 Clean, treat, protect, and care for cuts, scrapes, minor burns, itches, pain, skin rashes and insect bites with the Johnson & Johnson Red Cross All Purpose First Aid Kit. This versatile kit contains 140 first aid essentials, including cleansing wipes, gauze pads, antibiotic ointment, itch stopping cream, acetaminophen caplets, an instant cold pack, bandages, non-stick pads, rolled gauze, and more. Supplies come packaged in a durable, plastic box that keeps your items accessible, and organized! If you have anything in your studio or workshop, this is a MUST! Maybe, we should have made it #1... as everyone who works in glass knows that those splinters are the worst! Splinter Out is better than a needle because it is steam autoclave sterilized, and has a sharp tri-bevel point that is designed for loosening and pulling out splinters. There are 20 sterile splinter removers per box. 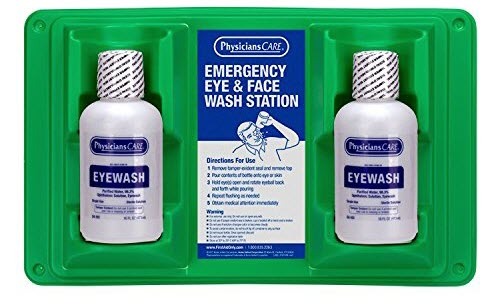 Eyewash Stations are critical! They are intended to mitigate eye injuries when control methods (eyeglasses or protective eyewear) do not prevent exposure to a physical or chemical irritant or biological agent. This Eye and Skin Flush Station includes two bottles of eye isotonic buffered solution with wall mount. Plus, an eyecup for easily focusing the fluid stream into affected eyes. When you accidentally touch the bead or piece of metal because it looks cool... it becomes pretty important to have a good burn cream close by! FYI... This was actually the first thing I ever used from our first aid kit! ASAP365 Silver Gel by American Biotech Labs is formulated using their unique and patented 20 PPM SilverSol Technology solution. This silver gel can not only help to hydrate your skin but has also been shown to promote natural healing so, it's perfect to use as a natural burn ointment. WARNING: If you have a sulfur allergy, this is NOT for you!